IHOP said that sometime Sunday morning, the company’s Twitter account was hacked when a politically charged retweet appeared that caused some customers to pledge to never eat their golden fluffy pancakes again. 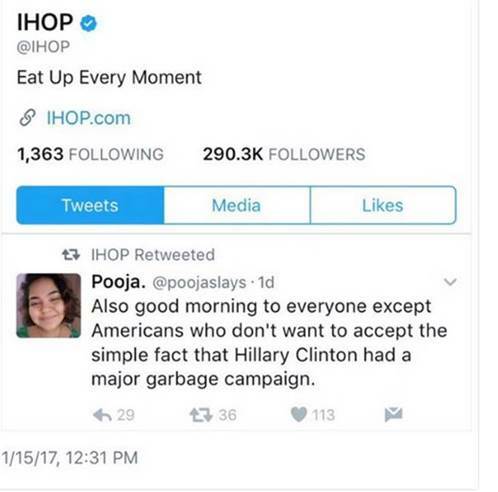 The International House of Pancakes confirmed to NBC4 the retweet in question involved a statement that Hillary Clinton ran a "major garbage campaign." 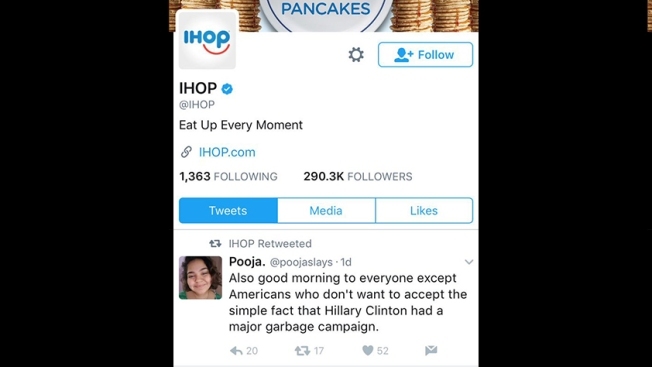 As soon as the IHOP team saw the retweet, it was deleted and IHOP took necessary precautions to make sure the company wouldn’t be hacked again. "At the core of the IHOP brand is a desire to bring people together and a commitment to creating a warm and welcoming environment for guests and fans everywhere, both in our restaurants and online. After a thorough investigation, we have confirmed that the IHOP Twitter account was hacked this morning. The retweeted post in question was immediately removed, and we have taken the necessary steps to ensure the security and integrity of our social media accounts. We appreciate our fans bringing this to our attention and recognizing that this is not normal content shared by IHOP."